← Sunday 10th May 2015 – Sowing seeds are go!! My copies of Lottie and Dottie Sow Sunflowers have arrived!! What a lovely surprise it was when the postman arrived late this morning (we don’t get our post first thing, usually it’s around lunch time). He had in his hand my personal copies of “Lottie and Dottie Sow Sunflowers”. I’ve read it already and even managed all the big words. I’m so clever, and very proud of myself. A HUGE, MASSIVE “Thank you” to Marijke for drawing the pictures so beautifully. They’re just amazing and so perfect. This made my day as I’m not feeling brilliant at the moment. I seem to have lost my voice (which is never a good thing, though I’m sure the family are secretly happy) and seem to have got a nasty cough and a bit of a sniffle. I was going to do some filming in the greenhouse today but unless I had subtitles down the bottom of the screen or that little person in the corner signing, you’d never understand what I was going on about. Hopefully my voice will be back to some form of normal tomorrow then I can make some more videos. So I’ll rest well and read some more of my book and look at all the glorious pictures which are so amazing. Hope you enjoy your copy. I just love the bees, although I think my favourite picture is on page 36!! This entry was posted in Uncategorized and tagged claire's allotment, Lottie and Dottie sow Sunflowers, Marijke Van Veldhoven. Bookmark the permalink. 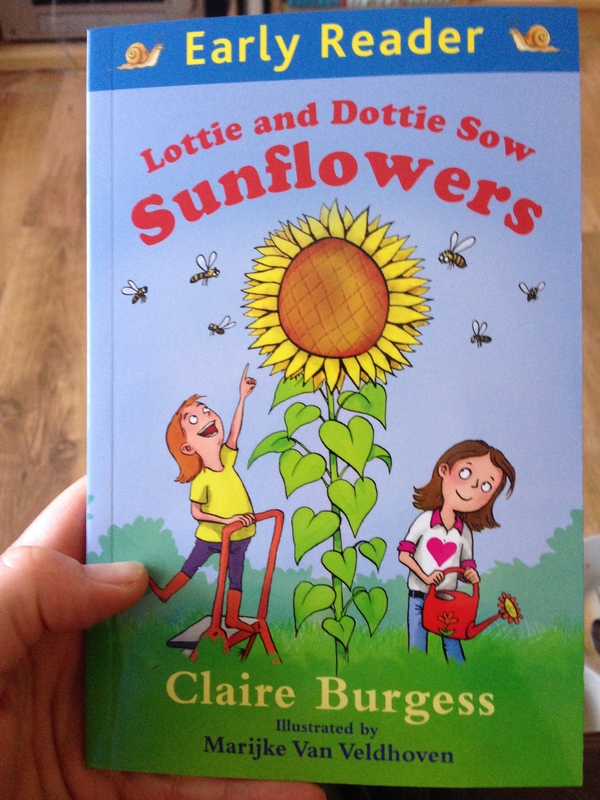 2 Responses to My copies of Lottie and Dottie Sow Sunflowers have arrived!! I find getting out of a deck chair can be a little challenging sometime. I don’t do that very gracefully.